How much does it cost to travel to Belfast? How much money will you need in Belfast? £109 ($142) is the average daily price for traveling in Belfast. The average price of food for one day is £40 ($53). The average price of a hotel for a couple is £116 ($150). Additional pricing is in the table below. These average travel prices have been collected from other travelers to help you plan your own travel budget. How much money do I need for Belfast? Belfast is the capital of Northern Ireland and the second largest city on the island of Ireland after Dublin. It has a population of about 270,000 and almost 500,000 in the metropolitan area. It's located on the mouth of the River Lagan and is set between many low hills that rise up around it. One of the most famous, and tragic times in Belfast's history is referred to as "The Troubles." During this time, between 1969 and 1997, there were many bomb and gun attacks throughout the city. This left many areas as essentially no-go zones. Neighborhoods became completely lawless do to the lack of security and the damage is still visible today in some areas. In 1998 the Good Friday Agreement was signed and much of the politically motivated violence ended. The city actually received praise recently as the safest city in the UK based on crime rate. Tourism is growing and many visitors enjoy seeing this less popular travel destination. The city has a lot of character and will give you an interesting take on Irish and British history. Belfast has a temperate climate and temperature and precipitation have little variation throughout the year. The climate is influenced by the warming effects of the Gulf Stream, making it warmer than many cities that are found at the same latitude. Rain is common with precipitation falling an average of 157 days a year. Snow is much less common, although it does happen about ten days a year. The warmest days during the summer may reach a temperature around 25 degrees Celsius and the coldest days have lows that drop just below freezing. If you're just arriving in Belfast, head over to the Belfast Welcome Centre at 47 Donegall Place, north of City Hall. They can answer your questions and set you up with maps and a day's itinerary. Belfast has some truly interesting sights including cathedrals, art galleries, and museums. Popular sights are the City Hall, Ormeau Baths Gallery, Saint Anne's Cathedral, the Belfast Central Library and the Titanic Boat Tour, among others. Belfast's center is around the City Hall, which is at the head of the main shopping area from Donegall Square to Royal Avenue. There are many old pubs along Donegall Place and High Street. If you go south from the City Hall then you'll reach Great Victoria Street. This is the area that is called the Golden Mile. This is where you'll find the Grand Opera House, Crown Liquor Saloon, Robinson's Bar and a lot of restaurants and bars. Queen's University neighborhood is where you'll find the Botanical Gardens, the Ulster Museum, and Stranmillis Village. East is on the waterfront with Waterfront Hall and the Lagan Lookout. The most obvious remains of the religious divide are to the west and north of the city. There are streets that are Protestant and those that are Catholic, each marked with flags and murals. You can take a guided tour of the area or visit on your own, just use common sense when you're in the neighborhood. 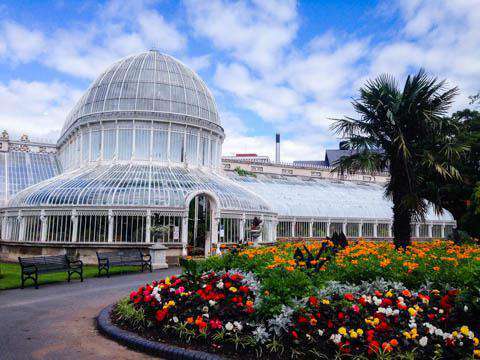 There are a handful of different tours that are worth doing in Belfast. In addition to the Black Taxi Tours, you can also do a tour of the Belfast Murals. These murals, that depict the political state of the city, can be explored independently, just head to The Falls Road or Shankill. If you're interested in doing some shopping, you absolutely must head over to St. George's Market. It's located on May Street near Belfast Central Station. It's the largest indoor market in Northern Ireland and is a great way to pick up some interesting souvenirs at a great price. It's also fun to simply wander through the market as it gives you glimpse into what daily life is like in Belfast. There's also a farmers market here on Saturdays between 9:00 and 3:00. There are a wide variety of restaurant options in Belfast. Budget options are relatively easy to find, particularly at lunch time, when prices are generally lower. There are some good and affordable Indian and Italian places, as well as sandwich places where you can grab a quick and cheap meal. If you're interested in splurging on a nice meal then there are some great fine dining restaurants around town as well. This includes one Michelin Star restaurant, Restaurant Michael Deane on Howard Street. Generally speaking, the center of Belfast can be navigated on foot. If you plan to travel a little further, there's a decent bus system that is relatively easy to figure out. If you find yourself lost, then it's important to know that most major bus routes will pass through Donegall Square. On the square you'll find a metro information kiosk that can answer all of your questions. A popular way to experience the city is on a Black Taxi tour. You can organize this at your hotel or hostel or at the tourist information office. The tours are given by taxi drivers who worked during the troubled years. These drivers are an excellent resource of information and knowledge, and they have a first hand perspective on the city's history. The tours last about two hours and are worth taking. Not far from Belfast are numerous castles, cliffs, and stunning countryside. You can see it all on these Game of Thrones tours from Belfast. An obvious first stop when you head to Belfast is to swing by the Belfast Welcome Center. It's located at 47 Donegall Place to the north of City Hall. Here you can pick up maps and get all kinds of good advice from the wonderful staff. You can also book tours here. There are two companies that run interesting taxi tours. Taxi Trax of West Belfast can give you a tour for about 30 pounds. Alternatively Black Taxi Tours also provide tours for roughly the same price and they do give group discounts. They also pick you up from anywhere in the city.